My mom is Chinese and my dad is American-born, with parents from Germany and Hungary. I was born in Hong Kong and grew up outside of Seattle. How did you first become interested in Cuba? When I was young, I didn’t have that much interaction with the Latino community, but I have always loved salsa and Brazilian music. Salsa dancing ended up becoming my portal to Cuba. I started dancing in 2008 while working as an au pair in France after high school. I remember asking my salsa teacher where he was from. He was Cuban and the type of salsa we were dancing happened to be rueda de casino. That really peaked my interest. I became interested in learning more about the music we were dancing to, and decided that it was important for me to learn Spanish to be able to understand the lyrics and better communicate with the people I was dancing with. When did you first visit Cuba and what made you keep going back? I first visited the island in 2009. What really drew my attention was how vibrant Cubans are. It just feels like they are so alive. There is a sense of community everywhere. People talk to each other on the street, at a bus stop, or as they wait in line. The sense of community in Cuba is palpable. For example, even though growing up, I lived in the same house for fifteen years, I never knew my neighbors’ names. Something like that would be unthinkable in Cuba! When did you start working with InsightCuba? I joined InsightCuba in 2014. It was exciting that my first season of work coincided with Former President Obama’s announcement of the normalization of diplomatic relations with Cuba. Since then, I have led over 45 trips to Cuba with Insight, for over 700 travelers. What is your favorite thing about Cuba? My favorite thing about Cuba is definitely the spirit of the Cuban people. I am so appreciative of their joy, vitality, and their spirit of resilience. Even though they confront a lot of challenges, many beyond their control - such as the effects of the US embargo – they confront these challenges with grace. I am so impressed by how generous people are with one another, even those who live in the most modest of conditions. I also really appreciate the feeling of physical safety that I feel as I walk down a street in Havana. Especially as a young woman, it is pretty unusual to feel this degree of safety in a big city. What about your favorite spot in Havana? Your favorite food? 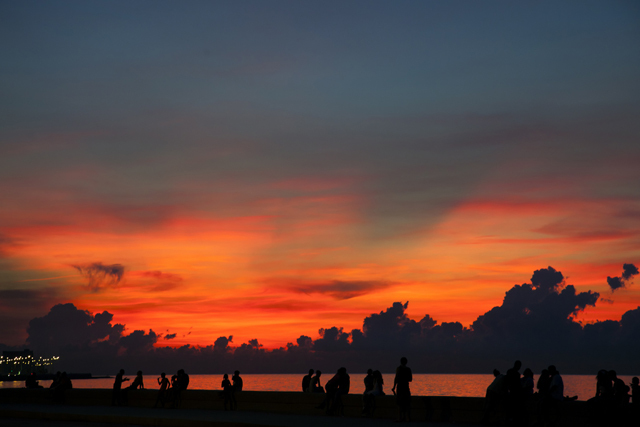 My favorite place in Havana is the Malecón [sea wall] at sunset. It is such an amazing spot to go to clear my mind, be alone, but also be with people at the same. My favorite foods are yuca con mojo [yuca with a garlic and lime sauce] and platano maduro frito [fried sweet plaintain]. Oh, and also coffee! I love Cuban coffee. Which tour do you like best and why? I love the Jazz in Havana Tour. It is so much fun to serve as a liaison between Cuban artists and music-loving Americans. During the tour, we spend five days in Havana, which is a great length of time to get to know the city. I also love the day trip we take to Matanzas to watch an Afro-Cuban folkloric group. They are great! What is your most memorable tour guide experience at InsightCuba? During my first season working with InsightCuba, I was leading the Weekend in Havana tour. We made a stop at Abdala Studios and when we walked in we saw that the Buena Vista Social Club was rehearsing! Everyone on the tour was psyched. It was a total surprise, and we all left feeling star-struck! It was an amazing moment. What do you enjoy about being an InsightCuba tour leader? I love showing people a place that I love. I appreciate how dynamic my work is; I am always meeting and getting to know new people. It feels like a dream job. I get to be in this place that I love and my role is to show it to others and help create a memorable experience for them. Why should Americans visit Cuba? Americans should go to Cuba to see it for themselves. Rather than believe propaganda or listen to hear-say, I encourage Americans to visit Cuba to draw their own conclusions. You get a totally different perspective if you get the first-hand experience of interacting with locals and seeing how they live. How have you seen Cuba change from your first visit? When I think about Cuba changing, I think about Raul Castro’s economic reforms and the reforms around travel restrictions which allowed Cubans to travel abroad more easily. I see these changes for example in the boom of private cafeterias and the burgeoning restaurant scene. When I first went to Havana nine years ago, even if you had the money, it was difficult to find a place that served a delicious meal. Do you have a tip you can share with InsightCuba travelers preparing for their trip? I would really encourage travelers to try out different forms of transportation. Hire a driver and do a convertible car ride for an hour. I also love bicycle taxis to get a sense of what it is like to be a local and get around. And cocotaxis are a blast! Also, I encourage travelers to bring more cash than they anticipate needing. Because it is virtually impossible to use American credit cards on the island, it’s great to have a cushion of cash for an unexpected art purchase, a nice night dining out, or to purchase cigars. It’s better to be safe than sorry! Miriam Psychas has a B.A. in History and Literature of Latin America from Harvard University, and spent a semester studying Cuban history, literature, and culture at the University of Havana. She was based in Havana for the fall of 2014 and 2015 directing a study abroad program and in 2016, traveled frequently to the island for her work in US-Cuba relations. She is an avid Cuban salsa dancer, and finds a rueda community wherever she goes!